Chalk it up to your 60-hour workweek or your family’s crazy, colliding schedules. Whatever the reason, you’re probably not shocked to hear that Americans are eating more meals alone than ever before. 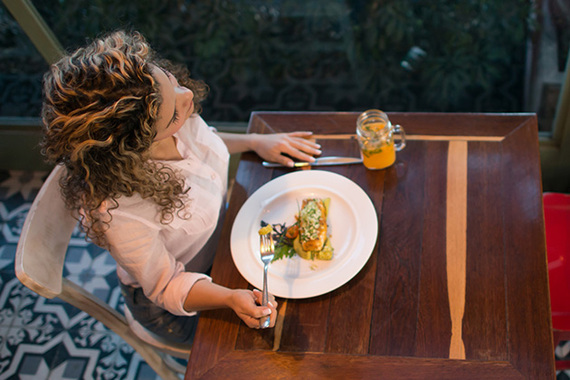 These days, almost half of all eating occasions happen solo, according to a recent report published by the Food Marketing Institute. And while previous findings show that it’s more common to do breakfast or lunch by yourself than dinner, more than a third of us admit to taking many of our evening meals alone, too. 1. You get to eat what you really want. Whether you’re cooking for your family at home or meeting friends at a restaurant, dinner with others usually involves some amount of compromise. One person might not do dairy, the other is experimenting with cutting out gluten, and someone else just has this weird thing about beans. Whatever. You know the drill. While it’s great to try to please everyone, sometimes you just aren’t in the mood to deal. And when you eat alone, you don’t have to. Whether you just feel like a salad or have a massive craving for a bowl of mac and cheese, you can have it. Which might sound dangerous—but it can also be a good thing. Because even if your meal isn’t the healthiest, if it feels satisfying, you’ll likely be less tempted to start rummaging through the fridge in an hour for a snack. 2. You’re more mindful of your portions. But when you’re flying solo, the only cues that tell you when to stop eating are the ones coming from your own stomach. The result? You’re more likely to put down your fork when you feel full as opposed to whenever seems socially appropriate. But remember, this principle flies out the window if you’re doing something mindless while you’re eating, like scrolling through your phone or watching TV. So put down the devices. Happily, when you’re on your own, that becomes a non-issue. So you can save those calories for whatever it is you really feel like splurging on later. And avoid having to cough up $9 for a mediocre dessert.